Hurricane Maria, strengthened to a "potentially catastrophic" category five storm, has torn into the Caribbean island of Dominica with sustained winds of 260km/h (160mph). Prime Minister Roosevelt Skerrit posted on Facebook that his roof had been torn off and he was "at the complete mercy of the hurricane". He said his house had flooded, later adding that he had been rescued. Dominica's airport and ports have been closed. Maria is moving roughly along the same track as Irma, the hurricane that devastated the region this month. The nearby island of Martinique has declared a maximum-level alert while another French island, Guadeloupe, ordered evacuations. 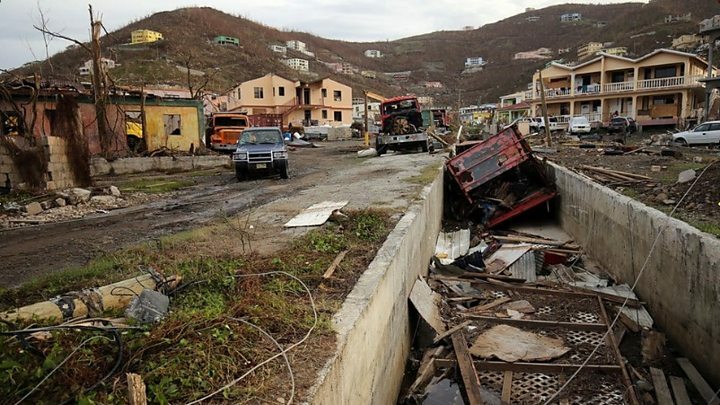 US Virgin Islands and British Virgin Islands: Both island chains suffered severe damage from Irma and President Donald Trump declared a state of emergency for the US territories on Monday. British authorities fear debris left behind by Irma could be whipped up by the new storm and pose an extra threat. Some of these islands are still recovering after being hit by Hurricane Irma - another category five hurricane which left at least 37 people dead and caused billions of dollars' worth of damage. The islands bearing the brunt of Maria are part of the Leeward Islands chain and include Antigua and Barbuda. The latter was evacuated after being devastated by Irma. The US National Hurricane Center (NHC) increased the strength of Maria in just a few hours on Monday from a category two storm, to a category four and then to category five - the highest level. 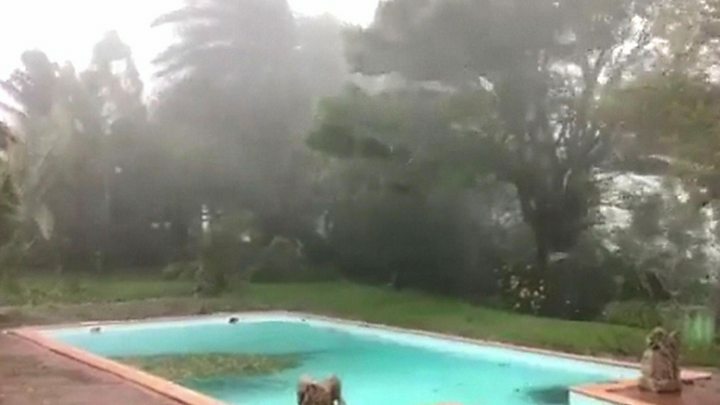 Forecasters warned that heavy rainfall caused by the hurricane "could cause life-threatening flash floods and mudslides". Dominica is a former British colony with a population of 72,000 about half way between Guadeloupe and Martinique. The eye of the hurricane made landfall there at 21:00 local time (01:00 GMT Tuesday), the NHC reported. All ports and airports are closed and residents near the coast have been ordered to go to authorised shelters. Curtis Matthew, a journalist based in the capital, Roseau, told the BBC that conditions went "very bad, rapidly". "We are not able to even see properly what is happening on the road. The winds are very, very strong, we can hear the noise on the outside. We still don't know what the impact is going to be when this is all over. But what I can say it does not look good for Dominica as we speak," he said. 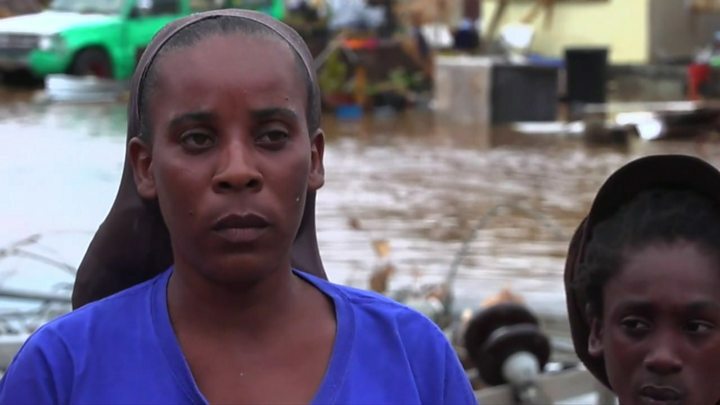 Martinique raised its alert status to "violet", the highest level, and ordered its population to seek shelter. In Guadeloupe, schools, businesses and government buildings have all been closed and severe flooding is predicted. The French government has ordered low-lying areas on the islands to be evacuated, AFP reports. The British government said more than 1,300 troops were staying put in the region and an additional military team had been deployed to the British Virgin Islands where entire neighbourhoods were flattened by Irma. Virgin boss Richard Branson, who has a home in the Virgin Islands, has been tweeting ahead of Maria's predicted arrival, warning people to stay safe. Irma also hit the US, where several dozen deaths were linked to the hurricane. Nearly 6.9 million homes were left without power in Florida, Georgia, North Carolina, South Carolina and Alabama. A second hurricane, Jose, is also active in the Atlantic, with maximum sustained winds of 90mph. The centre of Jose was about 265 miles east-south-east of Cape Hatteras in North Carolina, the NHC said in its advisory at 18:00 GMT on Monday.